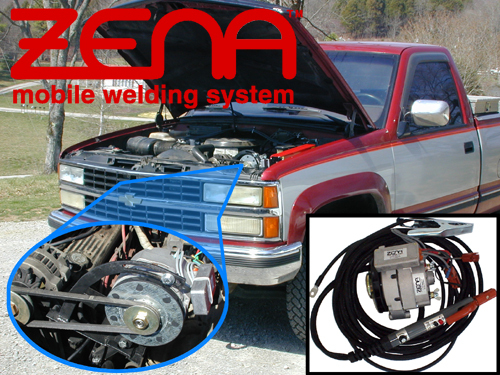 The ZENA™ mobile welding system is a self-contained, compact, engine-driven, high-frequency DC welder which can be easily attached to the engine of any 4X4 / off-road vehicle (as well as tractors, autos, trucks, utility and service vehicles, construction equipment, water-craft, military vehicles, etc. ), converting it into a sophisticated self-propelled mobile welding station, and saving thousands of dollars over conventional mobile welding equipment. electrically isolated, fully regulated high amp quick charger! Thanks to patented technology, the ZENA system's power generator is ultra-compact without sacrificing reliability or performance -- and, installation is easy to accomplish. Installing an electrically isolated ZENA welder does not adversely affect existing vehicle electrical or mechanical systems -- it will not void vehicle manufacturer's warranties -- and it cannot damage delicate on-board vehicle computer controls systems. Installation can be done professionally, OR is easily accomplished by a skilled do-it-yourselfer. Featuring a unique patented electronic control system, the ZENA system makes welding easier for the novice, and offers the professional unparalleled control of the welding process. Our fingertip welding controls also provide significant safety features which are particularly important when operating in difficult environmental conditions. Designed for 100% duty-cycle commercial use, the ZENA mobile welding system comes with a three (3) year limited warranty which does not exclude commercial use. Built to meet or exceed military and underground mining equipment specifications, no other welder better meets the unique maintenance requirements of marine, agricultural, and industrial users as well as others who need access to superior, high-power welding equipment that can be used for repair work anywhere -- operating ultra-reliably and ultra-safely in remote locations. High quality 20 foot long welding cables are standard equipment on all models. Cables from 30 to 200 ft. are available on a custom order basis and (thanks to our patent pending technology) the system operates with no loss of welding power when using the longer cables. Various models are available and custom welding systems can be built to meet your exact requirements. Buy risk free using our Online Store. To receive a special discount available just to Off-Roaders (enter "off-roader" into the online order form to get your discount) on the ZENA welding system of your choice. © Copyright 1998,1999, 2000 by ZENA, Incorporated. All rights reserved.